Hi everyone! Hope you're all having a great weekend so far. 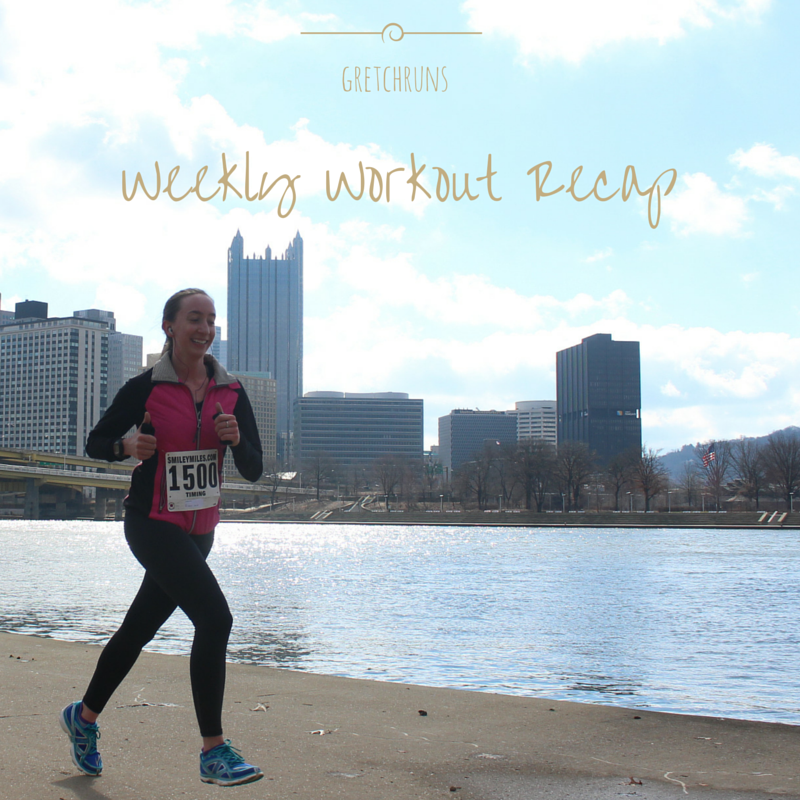 While I was training for the Biggest Loser Half Marathon, I made weekly posts recapping my workouts. After the race I stopped these posts, and I've noticed that my motivation to workout, especially cross training, has been severely lacking. This week was really my first week back to regular workouts. In June, I ran in three races and was also gone every weekend. It was definitely a busy month, so now that I'm a bit more settled down, I really focused on getting back in shape. I also wanted to start running in the morning again! During my last training cycle, I started getting in the habit of waking up before work to get my run in, and I really enjoyed it. Now that I've stopped that, it's really hard waking up. Hopefully next week I'll be used to an earlier wake-up time! Enough rambling on for now, let's get into my week of workouts! Run with Selma! She was super hyper after all the excitement from the weekend at the lake house, so I took her out for a long run/walk in Schenley. I would consider this a speed session because she runs super fast, but has to take lots of breaks! No watch on the run, but it was around 30:00. Dan wanted to go for a run after work, so I joined him. We started slow around 10:00 miles and kept picking it up. By the end we were both super sweaty and tired! Woke up early to run before work, and the humidity was crazy! I took it nice and was pretty tired the entire time. Not the best run, but getting back into shape is never easy. After work I headed to the Humane Society to walk dogs for around an hour. According to my FitBit I had 23,000 steps for the day, so I was definitely moving a lot! I went to the Humane Society again after work, and spent more time with the doggies. A lot of them love going for a run, so I definitely got some miles in, but nothing major. Early in the run, I hit a pothole weird and had a minute of panic when I thought I seriously hurt my ankle. Luckily I was completely fine and my run turned out to be great. Let that be a lesson to all- be very careful when you're running, especially in the morning! I was already a mile from home and there was no one else around, so if something was really hurt it would be a painful walk home. I haven't been to a strength class in quite a while, so this class was brutal! I was so tired and sore, and everything felt really tough. Definitely lost some strength and I have some work to do to get back in shape. 1 hour of yoga at West Park. Great class that was pretty challenging on the legs. I was still sore from Group Power, so this was tough for me! Some of the stretches felt great and the weather was perfect! Hot run. I should really start running earlier in the day on the weekends! I stayed on the trails for the first half, so it was a pretty challenging and tough course. Second half was at Schenley oval, which was sunny and hot but level. I think this was a great week back to training! I would have been happier if I got that last half mile in to get an even 20 miles, but it's a start. I also did yoga and strength training, which was much needed. Hopefully next week will be even better! You had a great week. Nice win on the Fitbit challenge! The weekly posts do seem to help with motivation. My long run this a.m. was obsolutely miserable with heat and humidity. Thank you!! And thanks for hosting that challenge..it's a great reminder to walk around at work! Getting back to running, that looks like a great week! It's always hard to get back into it, but after a few days it's like you never left! Definitely a great week back to training! As for running early on the weekends, I think even running after the sun is up feels tougher, but on the weekends I would like to sleep in a bit since I get up so early on weekdays, so it's a dilemma for sure! Same here! I don't feel motivated at all to wake up early. Plus, I feel like I deserve a treat and should sleep in. Then when I run later I curse myself for not getting it over with when it's nice a cool!